I finished up the last of my Sarah's Cards Jan kit making a few quick birthday cards. That's more or less the end of the kit now - four layouts and three cards isn't bad I don't think. 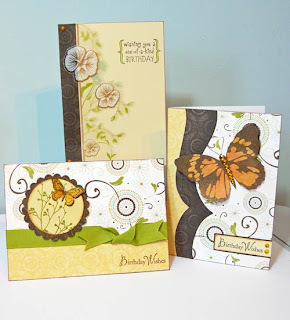 The butterflies on these are stamped onto Glimmer-Misted card for a smidge of sparkle :). The card at the back is made using part of a Fancy Pants transparency I didn't think I'd ever use on a scrapbook page. Always useful to have a few extra birthday cards around if you are as forgetful as I!!! These are just gorgeous Katy.All my kit is now gone too, really loved this kit.